JMeter is a popular tool for executing load tests. There is much information about it on the web. 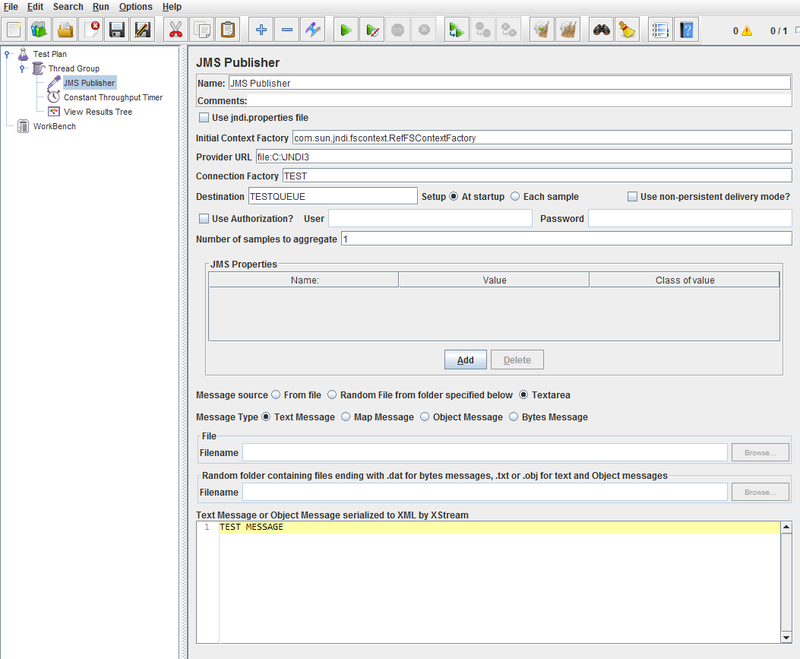 However, integration of JMeter with WebSphere MQ Series (JMS provider) is not that common. Let's try to do it! Make sure that you specified the right localization of the folder containing .binding file and ConnectionFactory and Destination names are exactly the same as you specified during .binding file creation. JMeter is ready to go. You can start torturing your application. Have fun! This is almost helpful. If you could explain about the .binding file and examples of the ConnectionFactory and Destination names... and maybe text version of the InitialContextFactory. thanks. For those trying to get this working I also stumbled upon this blog that helped me with the initial idea, and here is what I had to do to finally make it work. Have an MQ Client installed (not necessarily on the JMeter server) - I did this using MQ Client 7.5.0.5 for Windows. 2 - Create the dir JNDI-Directory on the C: drive. You will need this to save .bindings file. In the command prompt - define the parameters as below, replacing your values. 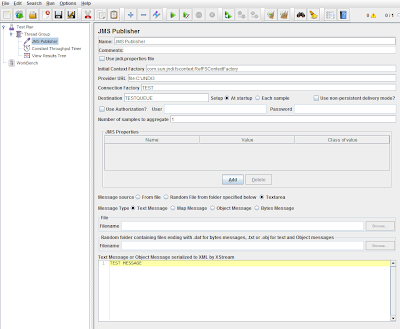 This will create the .bindings file that you will move to the JMeter Server and reference in the JMS Publisher sampler. Initial context is the same as in the screenshot. All other parameters are self explanatory. In my version of JMeter the JMS Publisher sampler has an expiration and priority fields, which if I left blank throw a Java error. I set them to 9999 and 4 respectively. -> Could not create the Java Virtual Machine. It is nice articles, sure helps for load performance testing on application side. But message queue has own storage, it stores all messages even it process or not. This is a very very useful article. Thank you so much. We have ActiveMQ broker and JMS messaging, We developed application (Desktop application in JavaFX) which uses ActiveMQ to send and receive data, Server side also ActiveMQ installed which receive data and update in database with different flags and later response will be delivered to client. Here ActiveMQ installed in client side and server side to communicate JMS mechanism. Desktop application can be installed in different machines which treated as number of clients, How can we do load test in this scenario. This is a vey very useful article.Thank you.